Simone Biles and Aly Raisman stood side by side in Rio Olympic Arena, clutching each other while waiting for the inevitable coronation. When the floor exercise judges validated what Raisman and every other gymnast has known for years - that Biles is the greatest of her generation and perhaps of all time - the U.S. Olympic team captain let her good friend go. Suddenly Biles was alone in the spotlight, the normally giggly teenager fighting back tears as she waved to the family that raised her, the coaches that molded her and the sport she is redefining. The secret is out. The pressure is gone. Biles belongs to the world now. Dynamic on vault. Effortless on beam. Jaw-dropping on floor. Brilliant as ever. And now, finally, an Olympic champion. 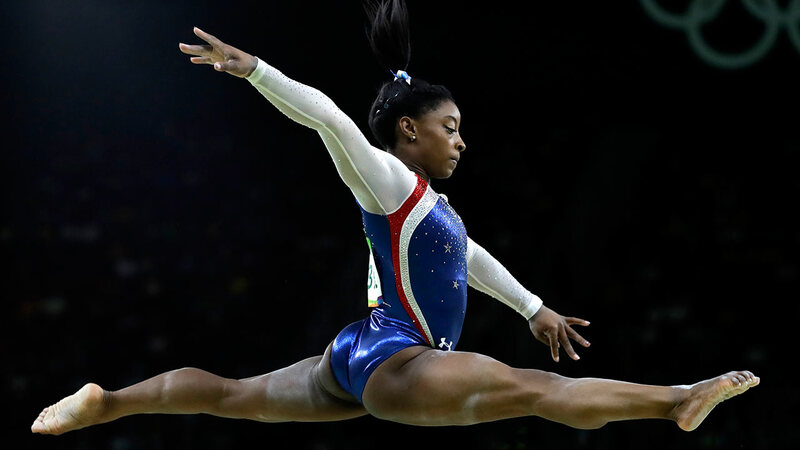 Biles soared to the all-around title on Thursday night, putting the gap between herself and everyone else on full display for the whole world to see. Her total of 62.198 was well clear of Raisman, who finished her remarkable comeback with a silver medal, and Russia's Aliya Mustafina. "It doesn't even feel real," Biles said. "To me I'm just the same Simone ... But I feel the same. I just feel like I did my job tonight." One that she does better than anyone else. Biles became the fourth straight American woman to capture the all-around and fifth overall. She and Raisman joined Nastia Liukin and Shawn Johnson in 2008 as the only U.S. gymnasts to win gold and silver in the same Olympic final. "I told her before today, I want you to win and I want second," Raisman said. Something that seemed far from certain last fall. A three-time Olympic medalist in London, Raisman appeared to be on the outside of the picture looking in after a shaky performance at the world championships that left her "devastated." Yet there she was 10 months later, standing on the podium with her fifth Olympic medal around her neck, the 22-year-old called "grandma" by her teammates having the last laugh and getting a measure of revenge after losing bronze in the 2012 all-around final to Mustafina on a tiebreaker. "It made me not think about things too much and made me more confident," Raisman said. "I knew going into tonight I was going to get the silver medal because I was going to hit four events." That's because gold has been out of reach for everyone but Biles for three years and counting. She arrived in Brazil with 14 world championship medals - 10 of them gold - with routines astonishing in their mix of ambition and precision. One last test awaited in Rio, a contest not so much between Biles and the rest of the field but between herself and the outsized expectations her dominance has created. Anything less than heading back to her family's home in Spring, Texas, with a fistful of golds would be seen as a disappointment. Biles earned the first one on Tuesday while serving as the exclamation point to retiring national team coordinator Martha Karolyi's going away party. While Biles insisted she's never looked ahead during her long run at the top, that's not exactly true. A portion of her floor exercise routine - the one that includes her signature tumbling pass - is set to Brazilian music that would fit right at home in the street right outside Olympic Park. It's not a coincidence. The girl adopted along with her younger sister by their grandparents as toddlers and discovered by coach Aimee Boorman's mother during a field trip to the gym is a wonder, even if it always didn't seem that way. Biles' talent is unmistakable, but it took time to harness. At one point Boorman pulled Biles aside and gave her a choice. Biles could continue to work out 20 hours a week, attend high school and eventually become a college gymnast or she could explore the elite level, a move that included more intensive training and being home schooled. Boorman asked more than once. And every time the answer came back the same: let's go for it. "I wanted to see how far I could go in this sport," she said. A decision that led to years of sacrifices and ultimately, the biggest night of her life. Though Mustafina led through two rotations, it was a mirage. Balance beam and floor exercise - where Biles is the defending world champion - lay in wait. She went back in front with a 15.433 on beam - and capped it with a 15.933 on floor that Karolyi called "very close to perfection." Only the judges don't hand out perfect scores anymore. Maybe one day Biles will make them reconsider. She'll have her chance next week when she can add three more golds during the event finals. Five trips to the top of the podium in one games is something gymnastics has never seen. Then again, doing things gymnastics has never seen is what Biles does best. The 19-year-old American soared to the all-around title on Wednesday afternoon, putting the gap between herself and the rest of the world on full display under the Olympic spotlight. Her total of 62.198 was well clear of silver medalist and "Final Five" teammate Aly Raisman and Russian bronze medalist Aliya Mustafina. Biles became the fourth straight American woman to win the all-around title and fifth overall while cementing her reputation as the greatest gymnast of her generation and perhaps ever. Her victory was never in doubt and she burst into tears when her long journey to this moment ended when her final total was posted.